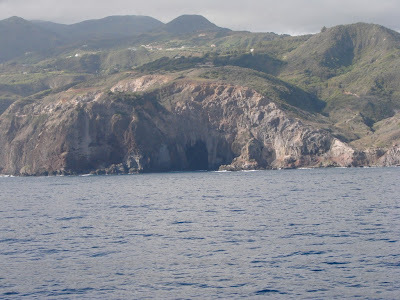 Sea cave seen along the volcanic coast of Maui from the Hawaii SuperFerry. These are generally not accessible by car though some adventure rafting companies on Maui will take you down the shoreline in rafts for an adventure. I hope to check this out one day on a future trip to Maui. If anybody has been on one of these please leave a comment about your experience. The Hawaii SuperFerry makes an approach to Maui from the western side. The view from the SuperFerry is far different than the view from the airplane and quite spectacular. Just the view from the approach and of the other neighbor islands makes the trip worth it. Resuming our voyage to Maui here is the view of the island of Lanai as we sail past it. 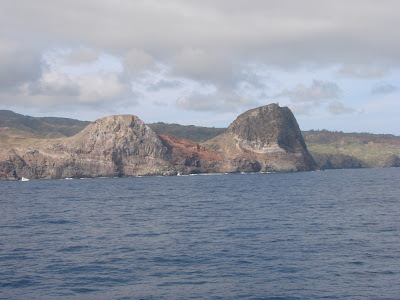 Lanai is the 6th largest of the Hawaiian Islands and is also known as the Pineapple Island. 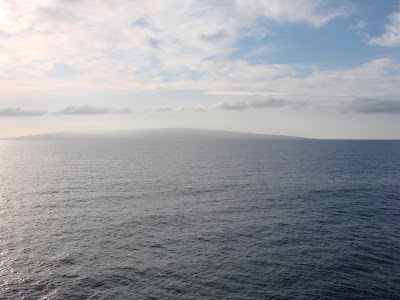 Sometimes the SuperFerry will pass between Molokai and Lanai and other times it will go around Molokai depending on water conditions so we were lucky to be able to see both islands this time.